No Reserve: The Limit of Absolute Power is a gripping and historically fascinating look into the dangers of mixing political power and economics in an emerging country. 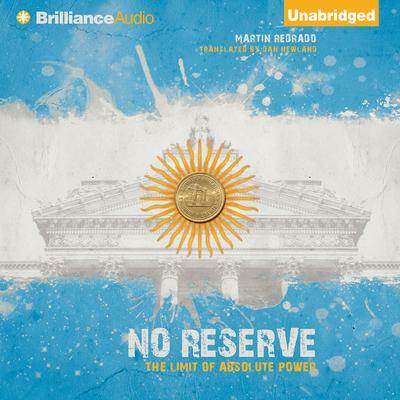 Written by Martín Redrado, president of Argentina’s Central Bank (2004-2010), readers learn how this Harvard-educated veteran of Wall Street and leading Latin American economist was appointed by the country's President, Nestor Kirchner, to lead Argentina through difficult economic times. By 2008, the country, along with the world, was in financial crisis and through the independent policies of the Central Bank was able to overcome for the first time in decades a history of cyclical breakups. At the beginning of 2010, when Redrado was asked to cover the costs of public spending and out-of-control national debts, his tenure was over. Ethical, determined, and loyal to his country, the author began his fight against financial corruption. Readers will be intrigued by Redrado's explanations of emerging world markets, tenets of central banking, and how governments can cause and avoid financial crises.